If you live in the U.S., chances are you've consumed genetically modified organisms, or GMOs, in the form of corn or soybeans. Now, the first genetically modified animal may soon be swimming its way to your dinner plate. A genetically modified salmon, called AquAdvantage, is awaiting FDA approval, and, when it does, the fish should be available for consumption in about two years, according to the company. Americans consume 300,000 tons of salmon yearly, according to Bloomberg Businessweek's Brendan Borrell. And with two-thirds of that coming from farmed Atlantic salmon — the wild version of which is endangered — the market seems ripe for an upgrade of the food. But not all are pleased with its arrival. The AquAdvantage Salmon is an Atlantic salmon that has DNA in its genome from two other fish. It contains the growth-hormone gene from a Chinook salmon, the largest Pacific salmon species, and a "promoter" gene from an Ocean Pout. The promoter is the "on switch" that keeps the fish's cells making growth hormone around the clock. The GMO salmon has a few advantages over its conventionally farmed counterpart. 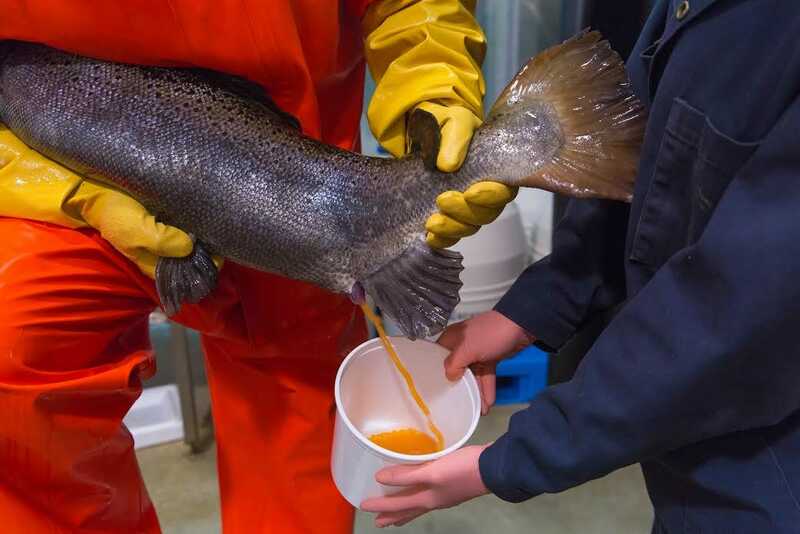 Constant hormone release allows it to grow more quickly — 16 to 18 months — compared to conventional farmed salmon, which grows in spurts during warm weather reaching market sizes in 31 to 36 months, according to AquaBounty, the company that created AquAdvantage. Their faster growth means AquAdvantage salmon also consume 25% less feed in their lifetime than conventionally farmed salmon, AquaBounty cofounder Elliot Entis told the Colombia Earth Institute. Conventionally farmed salmon are fed three pounds of other fish for every pound of salmon that ends up on our dinner plate. 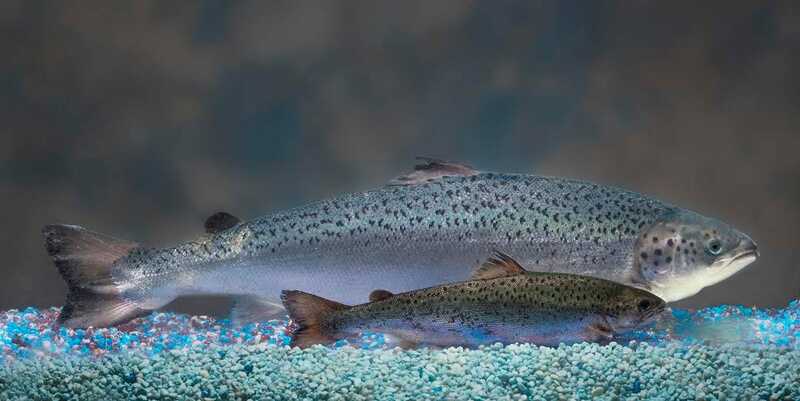 Genetically modified salmon need less than three-quarters of that, since half of the AquAdvantage salmon feed can come from plants without affecting their growth, according to the Earth Institute article. That makes the AquAdvantage salmon cheaper — with a production cost of about 75 cents a pound versus $1 a pound for conventional salmon, according to Borrell. This Salmon 2.0 might appear to have it all, but for some the changes are not upgrades. The impending arrival of a genetically modified fish elicited many objections, with opponents dubbing the product a "frankenfish." On the environmental forefront, critics worried that the GMO fish could escape, out-compete wild salmon and contaminate wild stocks. If the industry grew and fish farmers were able to purchase the eggs, they argued, environmental damage might get more difficult to control. On the health front, critics worried the fish could cause allergies, though all of the genes in AquAdvantage are from edible fish. With these concerns in mind, the FDA began its review of AquAdvantage in 1993. They examined the fish as an animal drug since Entis figured it was a more rigorous process that would placate the public and because adding genetic bits was somewhat comparable to adding a drug, according to Michele Henry at the Toronto Star. In 2012, when the FDA concluded that AquAdvantage was safe for human consumption and was unlikely to imperil the environment, critics awoke. Though the FDA had taken 19 years to consider the fish, critics pointed out that the regulatory body had relied on studies and subsequent conclusions straight from AquaBounty, according to Andrew Pollack in the New York Times. But, to some, this is nothing to be up in arms about. "It is a paradigm that we use in the U.S. in all industries that the producer of the product pays the cost of doing the studies which produce the evidence to the government regulators whether you're making airplanes or cars or drugs or a new fish," Bruce Chassy, a professor of food safety and nutritional science at the University of Illinois, Urbana-Champaign, told Business Insider in an interview. Still, others were not content with the studies. An article from the Consumers ! Union, which is connected with Consumer Reports, maintained that the FDA had "set the bar very low." This was "sloppy science" with tiny sample sizes, "questionable practices," and "woefully inadequate analysis," said the union report. So how worried should we be about this fish? "The scientific community is 99.99999999% not bothered by this fish at all. There is no scientific controversy, period," Chassy said. AquaBounty agrees. According to the company's website, the fish may be the most well-studied Atlantic salmon in aquaculture, with over two decades of research. Despite concerns, the company seems confident that the chance of the fish escaping — much more escaping, surviving, and breeding — is hardly in the realm of possibility. When AquAdvantage does gain approval, AquaBounty intends to distribute only female eggs that have been sterilized. 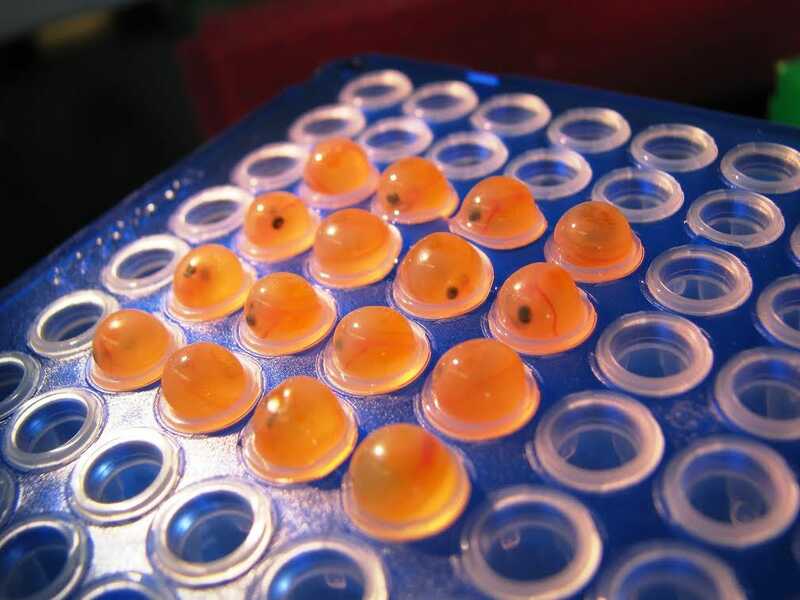 "Prior to leaving the facility, the fertilized eggs are treated with a burst of high pressure, a process with a 99.8 percent sterilization rate," wrote Borrell. And though some have pointed out that that still leaves .2% of fish fertile, they'll have a ton of trouble making it to the wild ecosystem, according to the company. AquAdvantage has built two facilities equipped like an "aquatic Fort Knox" to raise their GM salmon, in Panama and Canada. Their Canadian facility has 17 different barriers to keep the fish in and the anxious placated, wrote Henry. And the thermal and physical barriers of their Panamanian facility, "render the possibility of survival outside the facility virtually impossible," the company wrote in their FAQ. 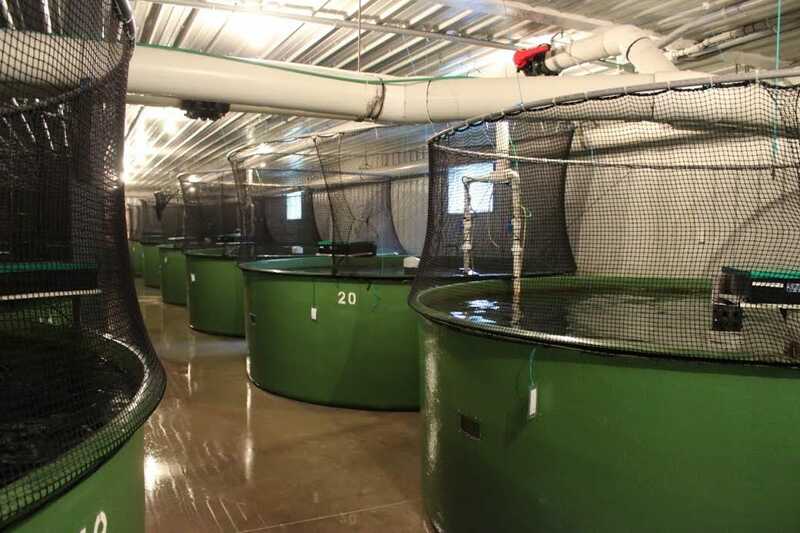 Eventually, when farmers do switch to AquAdvantage fish, they will also need to switch to AquAdvantage methods — land based tanks far from salmon habitat rather than the ocean sea pens used for conventionally farmed salmon. In the end, the argument can be made that scientific concerns for foods achieved through genetic modification are not so different than those achieved through selective breeding — which has been used for millennia to create our current domesticated livestock and crops. Any number of genetic changes in all different areas of the genome occur when you breed animals. "If it's rational to apply premarket regulatory review to [GM foods] it's even more rational to apply it to things that are bred by other modalities of breeding which are much more ... random and chaotic," Chassy said. So if the scientific verdict is out, what is really going on here? Chassy thinks the conventional salmon fisheries don't want the competition. "This is an opposition to new products to protect markets. That's all this is," he said. "This is a political, economic, social, and values based issue. It's not a science issue." After more than 20 years, will this fish ever make its way into stores? After the 2012 ruling that the fish was safe, the FDA opened for public comment receiving more than 37,000 comments, according to Businessweek. The forum ended in April 2013. "That should have triggered a decision within six months," wrote Henry. "It is now month 14." AquaBounty won't speculate on when they will hear back, Dave Conley, a representative of the company, told Business Insider in an email: "We have been waiting since September 2010 when the FDA conducted a public meeting on our application ... and we are still waiting." The FDA says they are still reviewing the comments to see if any new information might render its previous conclusions false, according to the Toronto Star. While AquaBounty continues its research in Panama, 62 tons (100,000 fish, according to The Star) of AquAdvantage salmon have ended up in an on-site Panamanian landfill since it cannot be legally sold, according to Bloomberg. "No other country has approved the sale of GE [genetically engineered] animals for food," Alison Van Eenennaam, who studies animal genomics and biotechnology at the University of California, Davis, told Business Insider in an email. AquAdvantage eggs have been approved by Environment Canada for commercial production, but they cannot sell them until FDA approval is received, Conley said. And while the company continues research, it has seen too many false starts to plan too far ahead. "We will consider our next steps only after we are assured of an approval," Conley said. "From the date of FDA approval, it will take about two years before any AquAdvantage Salmon is ready for market," he said. Then the question will be, where can you buy it? Sixty-five supermarkets and a handful of restaurants have pledged not to sell the fish, wrote Borrell. Perhaps there is one thing all sides can agree on. Anne Kapuscinski, a Dartmouth College sustainability professor who studies transgenic fish, told the Star: "This fish is precedent-setting."